Carmen Mardónez is a Chilean artist currently living in Los Angeles, California. 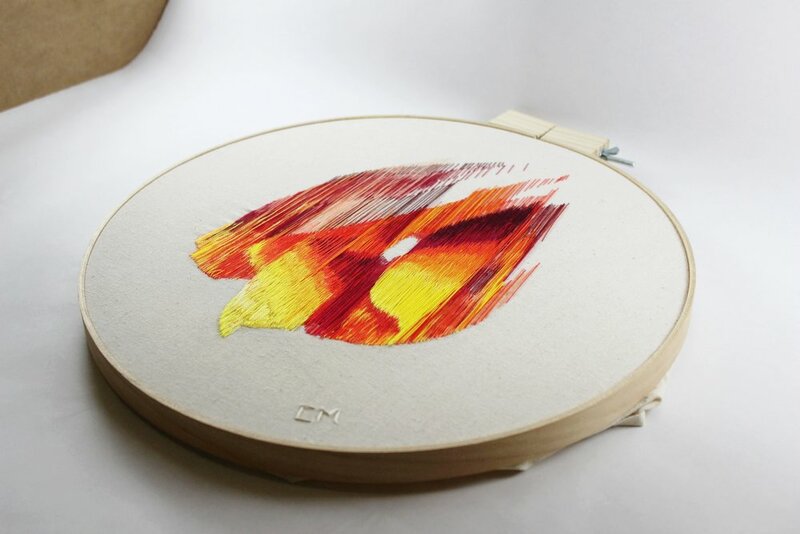 Her work is focused on exploring how to convey movement, color, and lights through hand embroidery, finding inspiration in Northern Lights, and Telescope captures. In Chile, she worked as volunteer and professional in prisons and local governments, whereas her artwork was a personal search. Since arriving in Los Angeles, she is completely dedicated to embroidery. You can find more of Carmen’s work on her website and Instagram. I belong to a generation that takes the Internet for granted. In my personal life, from shopping to reading the news, from collaborating and working with other people to watching movies, I’m connected most of the time. All the more now that I’m far from my family and friends, so I use the Internet to feel close to them. In my work as an artist this is not different. Artists, in order to their art to be pertinent and meaningful, have to live in their own time. This doesn’t mean to be naive, but not archaizing either. The Internet is not just the channel to share my work, but a place in which I can be connected to and interact with hundreds of artists from different places in the world. Of course, it has some drawbacks too. Sometimes I feel discouraged after seeing a lot of incredible artists, wondering if my own work would reach that point anytime. Other times I feel disappointed when I see other people stealing my work and attributing to their own. I’m also convinced of the value of face-to-face interaction with people, and of the direct encounter with art when possible, which could sense pretty obvious but it is not always the case. However, I really enjoy the possibility of sharing ideas and creations with people that otherwise would be too far to contact, and getting inspiration from online sources. I’m currently working on a Northern Lights series and starting to embroider space landscapes captured by telescopes (particularly the Hubble). I have never seen Northern Lights (yet), and I have not seen a Black Hole or a Supernova (I hope this never happen face to face!). But I can have access to all those images just because of the Internet, and especially through Instagram accounts from travelers and scientific teams sharing their explorations and searches for knowledge. In fact, social media was also important in my rediscovery of embroidery, not just as a craft technique and a set of rules (as I learned it when I was a child), but as a tool for artistic expression. It was on Facebook, probably in 2015, where I encountered the work of Victor Espinoza, and I got captivated. In creating my artwork, I enjoy working with the colors itself, more than images, drawings, and figures. However, painting in my house was too dirty to have a constant practice. The work of Victor allowed me to discover the threads as an artistic mean, realizing that I can actually “paint” with them, with freedom and at the same time cleanliness. I believe that my artistic voice has been present during my life in different ways, although most of the time as a “B side”, complimenting my more intellectual or rational occupations. My more artistic side took prevalence as a mental health necessity some years ago. In the midst of a really hard time when writing my master’s thesis in psychology and intensive work in prisons of Santiago, Chile, I turned to the arts for inner equilibrium. The starting point was a couple of meetings with Victor, where he showed me some of his artwork and his way of working. After that, it was just a matter of experimenting and let the threads and movement to flow. 4. Sites like Pinterest and Instagram are popular places for artists to share their own work. They also act as public visual archives, often leading to creative work by others that walks the line between ‘inspiration’ and ‘infringement.’ Have you encountered copies of your work online and how does it affect you? What are your strategies for dealing with it? It just happened to me a few days ago, my sister found an Instagram account with a Northern Light embroidery using not only the same technique as me but even the same picture and detail of one of my artworks, without citing me or the original photographer. I confront the person and she only said “it came completely out of my imagination”, which is really hard to believe. I feel frustrated and in some way abused. I have worked so hard to figure out how to best represent the Aurora, and then someone comes and say “I just tried and this came out”. It is only a matter of recognizing your inspiration and all would be just fine. At first I thought that maybe I should make harder-to-reproduce pieces, but in the end, one should just do what one wants to express, I guess, without being influenced by how other people can misuse your artwork. I'm still thinking about how to protect my future creations. The most important thing that I constantly remind myself of is to wait for inspiration, but just be working and experimenting. The inspiration will eventually come, but as someone said, it should find you working.